Continuing with our love affair with the Kolkata music scene, one of our favorite musicians right now is the very talented Tajdar Junaid. Taj has been around for quite a while; he’s toured with Blackstratblues, provided music for Bengali art films, and was a member of the now-defunct Cal alt rock band Cognac. He’s just finished recording his outstanding debut album What Color is Your Raindrop, and plans to release it very soon. Tajdar’s songs have a certain wide-eyed beauty that reminds us of the smell of rain on grassy grounds, and we promise you’re going to like his music, too. Read on for a short interview with this gifted singer-songwriter. Top Five Records: Tell us a little bit about the musical journey that paved the path for your debut album, What Colour is Your Raindrop. When did you know that you wanted to be a musician? Tajdar Junaid: It’s all got to do with the Led Zep cassette that my cousin played when I was 13. I distinctly remember the song was “No Quarter” and then followed “Whole Lotta Love”. By then, I was sucked and swirling inside the speakers of my tape recorder. For two years, I kept persisting to get myself a drumkit but unfortunately we didn’t have enough space to accommodate one in the house. Those two years, I played drums on the school table and irritated my classmates by playing with pens on their back. My elder brother used to play guitars and there was a chord book around. When I turned 15, it dawned on me that my dreams of becoming John Bonham will never see the day, so I might as well learn the guitar to express myself. I started off with the chord book and the first song that I learnt was the riff to Nirvana’s version of “The Man Who Sold the World”. I used to save up my “lunch money” and go and buy cassettes. Of course I’d be hungry at school but man, when you hold that Led Zep or Metallica black album in your hands, you are so satisfied! 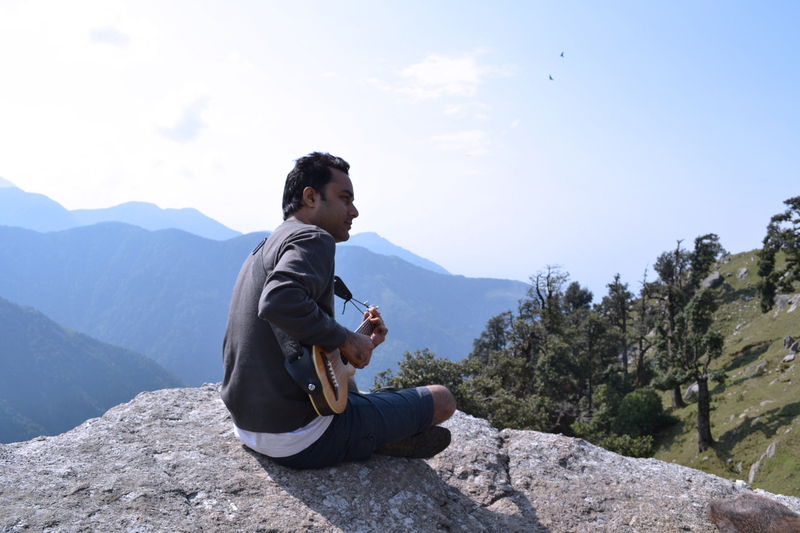 While in high school, I started looking around for a good guitar teacher and I was glad to meet Amyt Datta. He totally opened up avenues in my head I didn’t know existed. I started practicing more and more, and music slowly became a love affair. So the decision to become a musician was not a conscious one. It has been more about sticking to and holding onto what you love because it’s a peaceful feeling. TFR: Your album has a rather peculiar and intriguing name. What’s the story behind it? Guess who the cute kid is? TFR: We understand that there are eighteen different collaborators on your album – from all over the world and of all genres. How did that happen? TJ: I feel very fortunate to have some very talented musician friends from all across the globe. Thanks to the internet, these songs travelled all across to be recorded. I heard Greg Johnson, who is a fantastic singer songwriter from NZ on a CD when I was in high school and had barely begun to play the guitar then. I wrote an email to him appreciating his music and he wrote back surprised to know he had listeners in India. We lost touch until about two years ago, when we exchanged some music again. He liked what he heard and he asked me to play guitars on one of his song. And when I started recording my album, I knew a song of mine “Mockingbird” suited his voice perfectly. I met Fred White (from the thrice Grammy Nominated UK band Acoustic Alchemy) over Soundcloud.com. We heard each other’s music and got excited about the idea of collaborating and mixing my album. 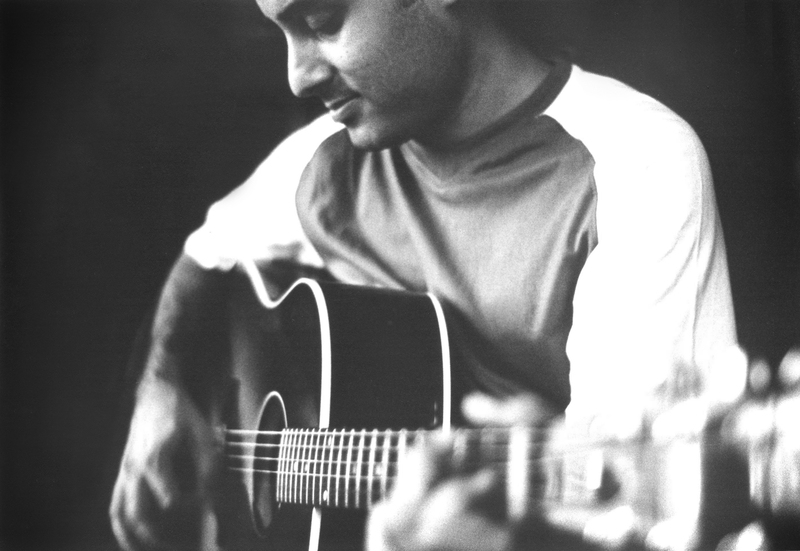 Vishal Nayak , who is an old friend from Calcutta, went to study music at the Berklee College of Music in Boston. He played drums on a song of mine from his home studio in New York. Anusheh Anadil who is a fabulous singer from Bangladesh sang on a song too. Vache, who is from Armenia, played the traditional Armenian flute Duduk. Nitzan Sagie is a brilliant composer from Israel and I met him over Soundcloud.com. He contributed on a song of mine called “The First Year”. It’s a beautiful surprise when the universe opens up its avenues to you and you end up collaborating and making music with people who you have never met in your entire life. TFR: You went from guitarist of an alt rock band [Kolkata’s Cognac] to a solo singer-songwriter with a seemingly endless array of instruments and influences. Did that happen organically? TJ: At one point of time I just got bored of playing the guitar and chanced upon Ustad Ali Akbar Khan’s music which completely changed my life and made me question my existence and role as a musician. I became curious and started listening to all the music I hadn’t heard before and learning new instruments with the help of the internet, such as the Ukulele, Mandolin and Charango. I realized my way to happiness is to remain curious and keep discovering my love for music in newer ways, similar to a kid in a candy store. TFR: You have toured as a guitarist for Blackstratblues in the past. How did that situation materialize? Have you played for Blackstratblues after that? TJ: Warren is a good friend and we have mutual respect for another’s music. Our common ground is our love for blues. He was preparing his first Blackstratblues tour in 2010 and I was visiting Bombay for a recording so it worked out well. I did play with him again recently and it was great fun. TFR: Some Bengali friends of ours – ardent enthusiasts of the region’s cinema, of course – informed us of your role as music director/composer in noted films such as Iti, Mrinalini (about a suicidal once-famous actress) and Dui Dhuranir Golpo (about two young transgenders from Kolkata). Very impressive! Do you find that there are differences in the composition process between Taj, the music director and Taj, the solo musician? TJ: If a scene from a film needs a simple melody, I should put aside my intellect and play a simple melody. And if a song on my album needs me to play a blues slide line,I should practice hard and learn to play that line because the song needs it. When I say “needs” I mean to say songs or any work of art has a life of its own and will tell you exactly how to shape it, only if one shuts his ego and intellect and listens quietly to the song or painting unfolding itself. It’s actually quite simple, we just love making things complex. But the bottomline of everything I do is to have fun and like what I do or else don’t get into it. TFR: Our favorite song from your upcoming album is the mellow “Though I Know” [download from NH7 here], which reminds us a bit of Eddie Vedder (and occasionally Beirut). 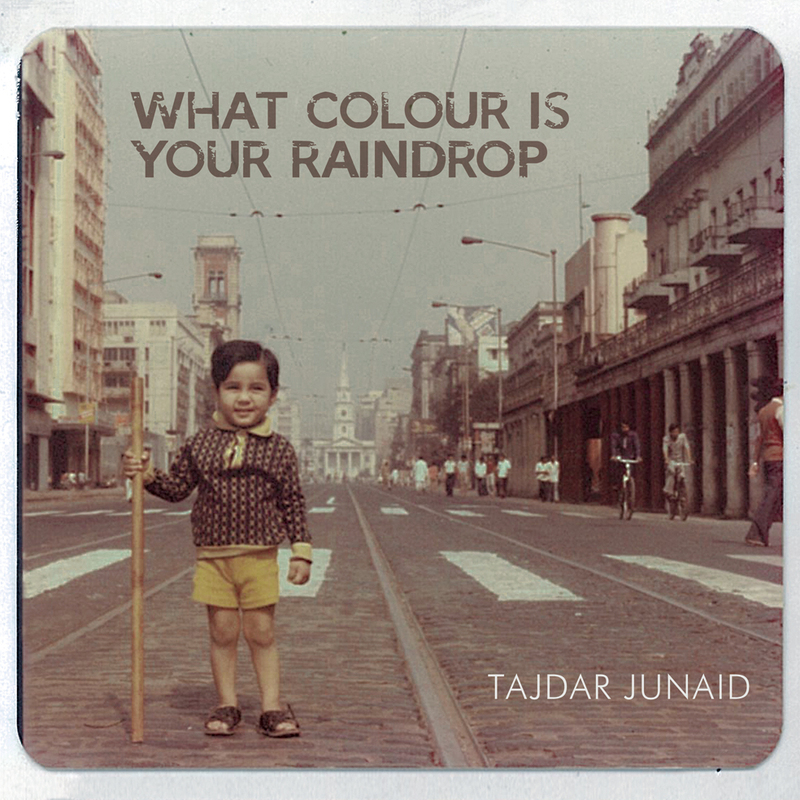 However, we think that the title-track “What Colour is Your Raindrop” has a strain of melancholic beauty that can often be found in Hindustani classical music. Tell us a bit about your undoubtedly wide spectrum of influences. TJ: I’m in love with music and with everything it does to me. It makes me happy, brings me calmness, it excites me, makes me travel in my head. Over the years I’ve understood that all forms of music have something good to offer so absorb the good and the bad will filter itself out. I love the serenity and etherealness of Indian classical, I love Chopin and his melodies, I absolutely dig Albert Collins and all the blues greats, simply because it is very moving, And Thank you Lord for the Beatles. It’s silly not to enjoy so much goodness around you. TFR: “Aamna” [another track from his album] is the kind of ethereal, delicate lullaby that parents should play to their young children. Tell us a few special things about this song. TJ: Aamna is my pride and joy. She is my little niece who is one year , four months right now. When she was born I used to keep her on my lap and play music to her and put her to sleep. I am a musician and the truest part of myself that I can offer is my music. I wanted to gift her something that could put her to sleep even when I wasn’t around. TFR: We’re very intrigued by the instrument that you play on “Dastaan”. What is it? How many instruments do you play on this album? TJ: It’s a 10 string folk guitar from South America called the Charango. I first heard it in the Ost for Motorcycle diaries and fell in love with the sound. I have played the guitar,charango,mandolin,ukulele,glockenspiel and sang on the album. I would like to learn the piano. It’s a beautiful instrument ! TJ: It’s me when I was 4 years old . Calcutta used to have a lot of strikes then and the roads would go completely empty. I used to be amazed by the traffic police and delighted to see huge cars and trucks stop with simply one wave of their cane. So I was filled with pride holding that cane and posing on the empty road. Perhaps I was grinning and thinking I brought the entire road on a standstill. You can listen to Tajdar’s amazing work on his SoundCloud or visit his website here.